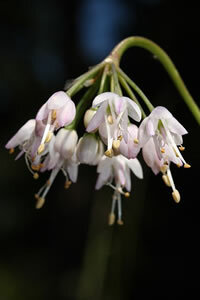 The bulbs are edible and were sought out by the First Nations people as a delicacy. During flowering season the gatherers would mark patches of bulbs, and then return in the late summer to dig the dormant bulbs. This was not just to collect the onions at their best flavour, but also to ensure that dangerous bulbs such as those of the poisonous Death Camass were avoided. For maximum freshness, please keep seed refrigerated in its original packaging until it is time to plant. Sow seeds in the fall, either in flats or directly into the garden. Leave outside over winter for germination in the spring. Grow in full sun to part shade, and well-drained, moist to fairly dry soil. May take a few years to reach flowering size.